Description: A loved one is sick. Your friend was just in an accident. A family member is facing an emotional crisis. Have you ever desperately longed to reach out your hand and bring healing to these needs? At times our hearts ache with the desire to help, but either we don't know how, or we are afraid and stop short. The truth is, the Holy Spirit within you is ready to heal the sick! 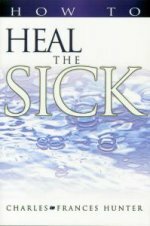 Charles and Frances Hunter present solid, biblically-based methods of healing that can bring not only physical health, but also spiritual health and the abundant life to you, your family, and everyone around you. Charles and Frances Hunter's simple faith in the Bible has caused them to be used by God in ministering to thousands of people worldwide. As best-selling authors and national and international conference speakers, they have shared their wealth of knowledge and experience of God's power and love, and the results have been dramatic and widespread.